Achieving water, energy and food security for everyone within the planetary boundaries is one of the greatest challenges humankind is facing today. 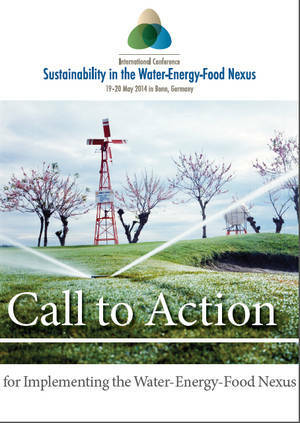 The International Conference on Sustainability in the Water-Energy-Food Nexus, meeting in Bonn, Germany on May 19th and 20th 2014, recognizes that water, energy and food are increasingly interrelated. Considering water, energy and food together in a “nexus” framework is both necessary and forward looking. Such an approach focuses on increasing resource use inefficiencies, which in turn reduce environmental pressures and maximize the benefits from scarce resources. A nexus approach can also produce benefits across sectors through cooperation and can help with identifying different interactions between interdependent social and environmental systems. Despite this, the strong linkages between water, energy and food are seldom understood and are rarely incorporated in the development of national and regional water, food or energy security strategies. Strategies that address water, energy or food challenges individually, continue to be promoted in many governance strategies despite the clear need for addressing the inter-linkages and inter-dependencies among these sectors in a nexus approach. Such individualized approaches unnecessarily degrade and waste natural resources and reduce access to them for the poor. Therefore, the connections between water, other natural resources, societal processes and the functioning of ecosystems need to be explored more systematically. Both the quantity and quality of resources matter. Sustainable development is strongly connected to the availability of sufficient and clean water for the preservation of ecosystems and human development. Policy decisions and actions require active cross-sectoral collaboration. Smart, targeted policy tools are needed to address trade-offs between increasing production sustainably, conserving natural resources and enhancing outcomes for the poor. THEREFORE, the International Conference on Sustainability in the Water-Energy-Food Nexus issues this Call to Action for policy makers, practitioners and researchers around the world to start developing and implementing strategies that jointly address water, energy, and food in a comprehensive nexus approach. The following guidelines aim to support policy makers, practitioners and researchers as they consider such approaches. Policies and governance mechanisms must be developed and deployed at different levels to implement a nexus approach. Doing so will help reducing negative impacts of policies on each individual sector, saving resources, minimizing trade-offs, and enhancing synergies..
Sector policies need to become more inclusive, better coordinated among each other and should safeguard both, the environment and secure rights and access to natural resources, in particular for the poor. Governments, the United Nations and other international policy organizations need to strive for adaptive management and cross-sectoral coordination. This includes assessing environmental and social impacts of policy implementation and developing as well as implementing, monitoring, and updating environmental management plans that consider the inter-linkages between natural resources. It is important to identify economic incentives to enable a nexus approach, e.g. price reforms to better reflect resource scarcities, and to increase efficiencies, as well as targeted subsidies without negative side-effects for other sectors and the environment. Innovative research and technologies are essential to support the implementation of a nexus framework by governments and other actors. Responsible governance needs to bring together the different stakeholders around water, energy, and food security strategies. These stakeholders need mechanisms that allow them to jointly address trade-offs and identify win-win strategies wherever possible as well as requirements and mechanisms for the implementation of such strategies. The ongoing development and formulation of the Sustainable Development Goals (SDGs) should consider and recognize the importance of a nexus approach to water, energy and food. Doing so will help promote consistency and complementary among the SDGs. The goals should reflect nexus interactions that can be monitored at different scales to increase the benefits for both humans and nature. The private and public sectors, international organizations and other research-funding entities need to better ensure that research is demand-driven and invest more in research on the nexus. This includes research on agricultural production, energy generation, water supply and sanitation, improvement of water quality and the status of aquatic ecosystems. This research should be solutions-oriented to facilitate technologies and approaches that support increased land, water, and energy use efficiency in a more integrated way. Resource-use efficient technologies for enhanced sustainability operate differently in diverse biophysical and socioeconomic contexts; thus, important groundwork by and with end users is essential. Development of resource-use efficient technologies needs to consider the scarcity of other interlinked resources. The research community and other stakeholders need to develop and apply research methods on the nexus and use tools to better inform decision-makers. This involves risk assessments, threat indicators, environmental and social impact assessments and Earth Observations. The research community needs to compare nexus and business-as-usual approaches for their costs and benefits. Such analyses can strongly support better informed decision-making as well as sustainable business models. Taken collectively, the above guidelines can constitute the centerpiece for Sustainability in the Water-Energy-Food Nexus.